I stumbled across this recipe on the Dulcet Devotion site and was instantly interested: healthy salad + bacon and feta? Best of both worlds! I made a couple of minor adjustments but otherwise it’s pretty close to the original. This was a light, satisfying salad that had crunchy, salty and sweet elements that had me going back for seconds. Next time I make it, I think I’ll add in some chili flakes or Sriracha for a spicy bite. 1. 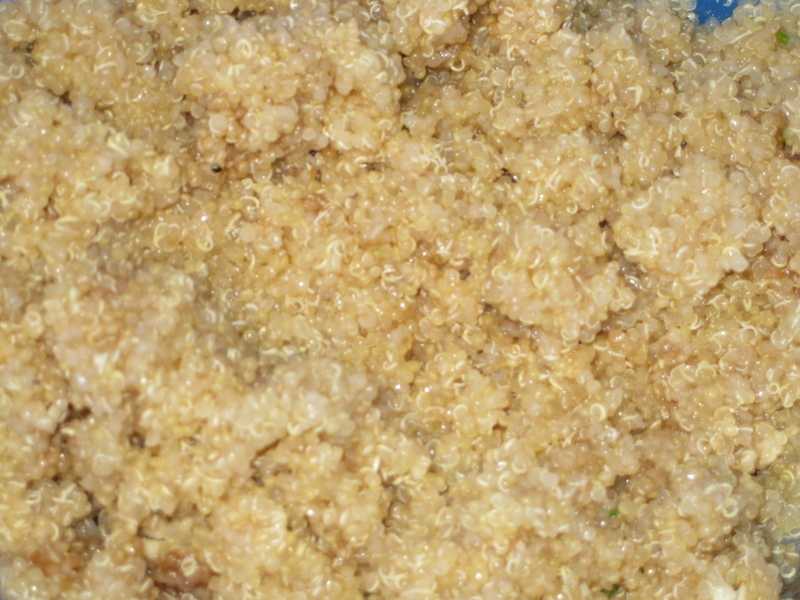 Cook the quinoa according to the directions on the package. Place in a large bowl and let cool for 30 minutes. 2. Meanwhile, cook, drain and crumble the bacon. 3. 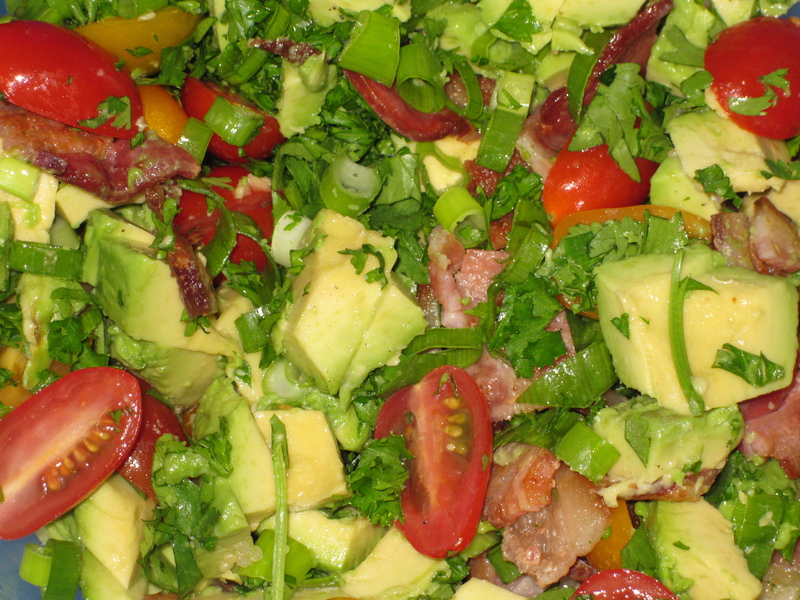 Put the tomatoes, green onion, avocado and herbs into a medium bowl. Mix together with a little bit of lemon juice. 4. 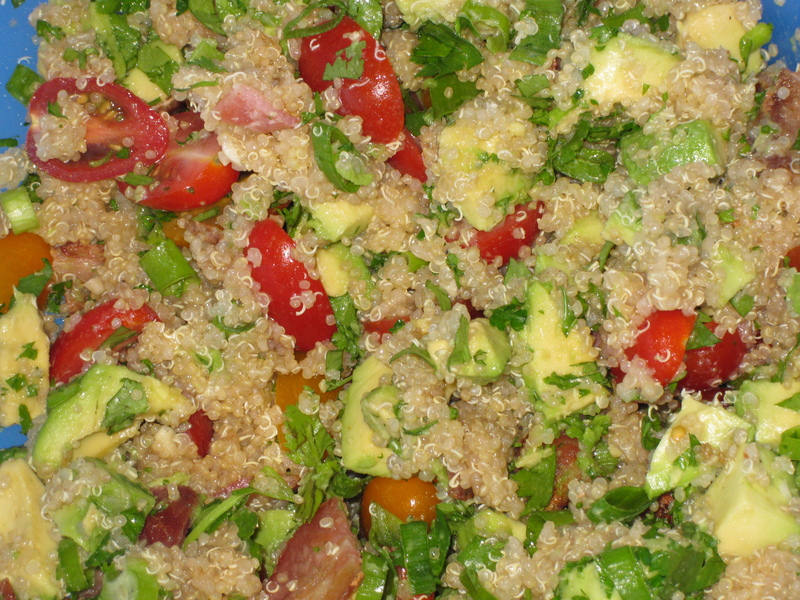 Once the quinoa has cooled, add in the olive oil, rest of the lemon juice, balsamic vinegar, garlic and salt & pepper. Stir to mix thoroughly. 5. Add in the rest of the salad fixings and season to taste, remembering that the feta will add some saltiness. 6. 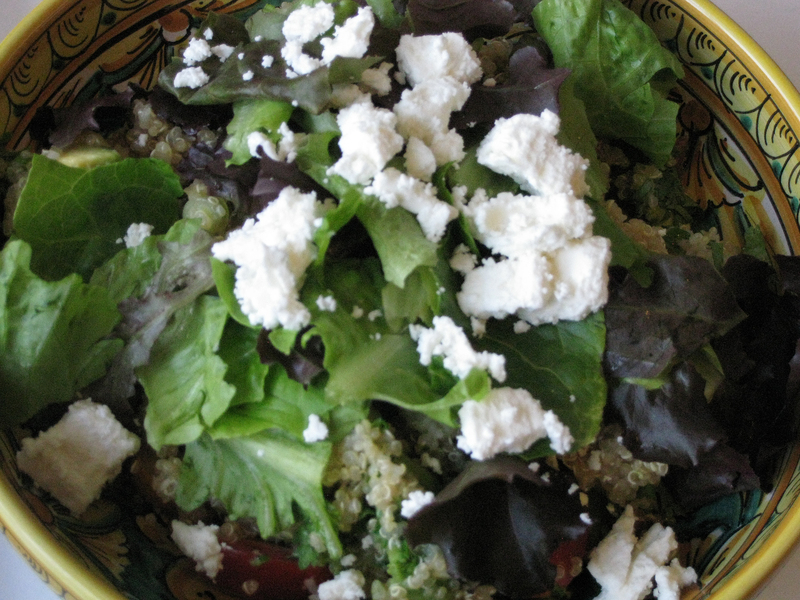 Plate the quinoa salad and top with greens and feta. Let’s face it: rice is…well, it’s just rice. It’s not the most exciting ingredient. But what it lacks in flavour it makes up for in versatility, transforming from modest to extraordinary with a few extra steps. This is a modified version of Tyler Florence’s recipe: I used peanuts instead of cashews as that’s what I had around. He also calls for mint, but you could use cilantro or basil, too. I served this with lemon curry chicken, but it would go well with shrimp, pork or fish dishes. 1. Put rice in a sauce pan with the ginger, 2 cups of water and 1 1/2 ts salt. Bring to a simmer over medium heat. Stir, turn down the heat, cover and cook 12 minutes. (If serving cold, spread the rice on a baking sheet and bring to room temperature.) Discard ginger. 2. Meanwhile, bring a pot of salted water to a boil for the beans. Fill a large bowl with ice water and add just enough salt so that you can taste it. Boil the beans for three minutes and then place them in the ice water for another minute or so to stop the cooking and maintain their bright green colour. 3. Place the mango, red onion, mint and cashews in a large bowl. Stir together with olive oil and season with salt and pepper. Add in the rice and beans, seasoning with the lemon juice. Re-season with salt & pepper if necessary. This is actually a recipe from the Joy of Cooking, but J adds creamed corn, either chipotles or jalapenos for some heat, green onion, as well as shredded cheese. Scrumptious, I promise. If you can get your hands on a cast iron pan, do so. It’s the best vessel for cooking cornbread as it will make the edges nice and crispy. Be sure to get it screamingly hot, too: that’s the key. 1. Preheat your oven to 400F and place a cast-iron pan in the oven. 2. Mix sugar and eggs in a large bowl. 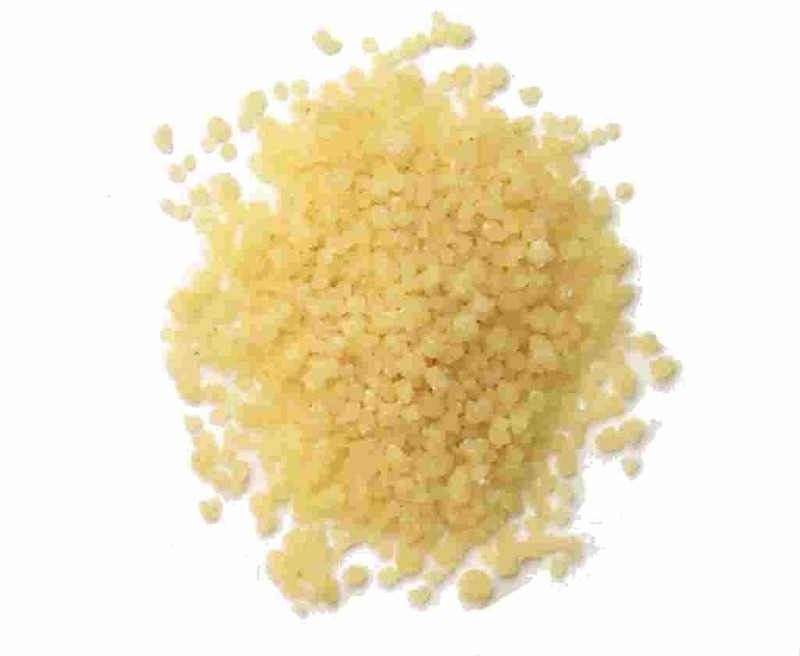 In smaller bowl combine, the flours, cornmeal, baking powder and salt. Add the egg mixture to the dry mixture – do not over-stir. 3. Add butter, milk, and cream (or buttermilk), again stirring just until mixed. 4. Carefully remove the now-hot pan and add the butter. Let it melt and then add in the complete mixture.Place in the oven and cook 30 minutes or until a toothpick inserted through the thickest part of the bread comes back clean. Apparently, I’ve become a grown up. I am now voluntarily eating not just Brussels sprouts but now rapini! Traditionally not a big fan of bitter greens, I have warmed to them in the last year so long as they are balanced with other flavours to cut through the bitterness. Cue J making Giada de Laurentiis’ sautéed rapini that has a nice kick with some chili flakes and sweetness from a handful raisins. 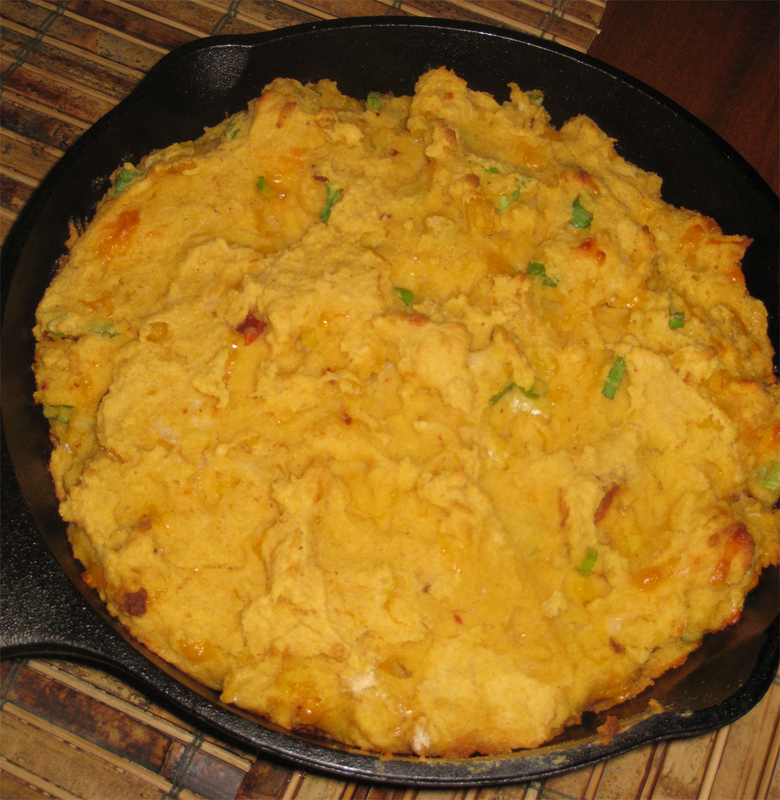 This side dish looked fantastic served in our colourful casserole dishes! 1. 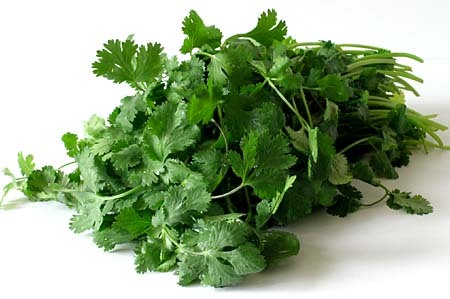 Blanch the rapini by dropping it in a pot of boiling water for 1 minute, then transferring it to an ice bath. Reserve roughly 1/4 of the cooking liquid. 2. Heat the oil in a heavy large skillet over medium heat. Add the garlic and red pepper flakes, and sauté about 1 minute. 3. Reduce heat to medium-low and add the rapini. Toss to coat. 4. Add half the the reserved cooking water, the raisins, and cook until the rapini is heated through and the stems are tender, about 4 minutes. Season with salt, to taste. 5. Right before you’re ready to serve, add the pine nuts and toss so that all the ingredients have combined. Brussels sprouts were the bane of my existence as a child. The mere mention of them would send me into fits of eye-rolling, gagging and desperate complaining with the hope of being spared from their inherent repulsiveness. My parents would insist that they liked them and I could only assume that they were either a) blatantly lying or b) insane. Fast forward twenty years and I find myself at the market, buying a pint of Brussels sprouts voluntarily. What has gotten in to me? It started back in the summer with reports of a friend making absolutely delectable Brussels sprouts for a group of eight or so. So the story goes, people were actually fighting (cordially…but still) over the last few sprouts. After verifying this story and hearing said people swear up and down that they were great, I began to rethink my stance. If all those people – most of whom hated Brussels sprouts as kids – liked them now, maybe it was time to give them another chance. Flipping through the NYT cookbook, I came across a recipe that looked easy and, importantly, included bacon. Bacon makes everything better, as far as I can tell. This recipe does require you to do a few steps, but if you have a food processor, it is well worth using it! Alternatively, if you have Brussels sprouts large enough, you could shred them on a box grater. Just watch your fingers! 1. Trim the Brussels sprouts. If you have time/desire to, you can core them as well but it’s not necessary. 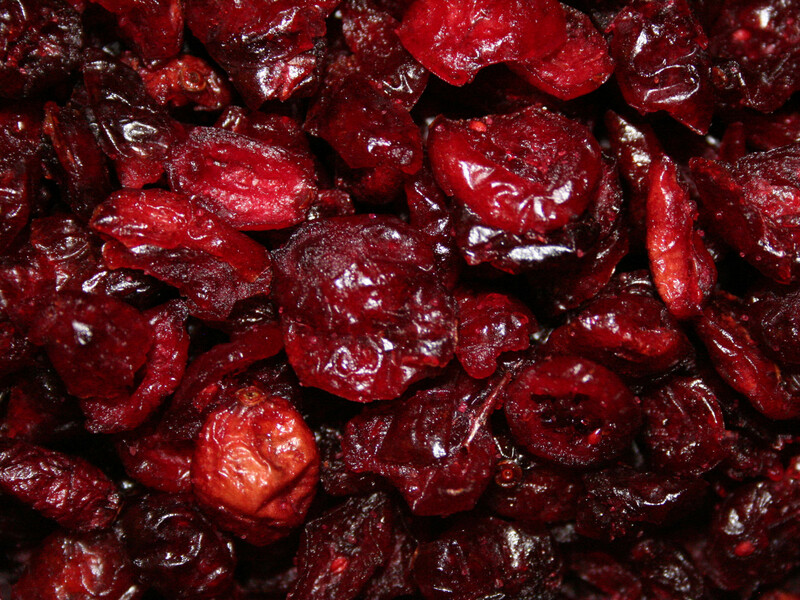 In batches, shred in the food processor. 2. Fry the diced bacon until crispy, roughly 10 minutes. When cooked, remove the bacon and drain on paper towels. 4. Add the sprouts, scallions and nutmeg. 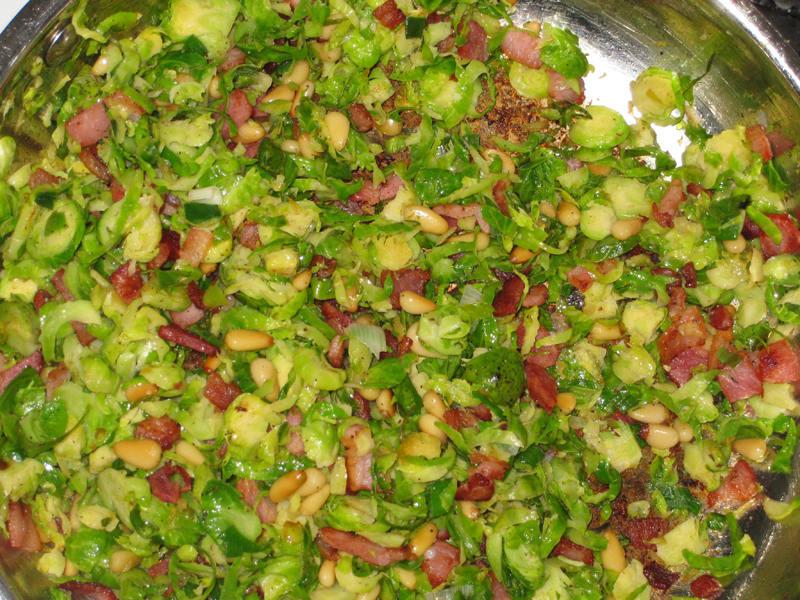 Cook until the sprouts are done, roughly 6-8 minutes. They should be bright green. In discussing what we’d have for our family Thanksgiving dinner this year, my dad made a specific request for sweet potatoes. Since my dad, really, never asks for anything I certainly couldn’t let this request fall by the wayside. Thing is, I haven’t made anything with sweet potatoes in years. I’ve made shoestring fries with them before, but they tended to come out a little, um, crispier than I’d have liked. I wasn’t going to let my dad down, though, so I scoured til I found something that looked easy enough to do while also making up the rest of the Thanksgiving fixings. Came across a great recipe that I tweaked just a smidge. In the end, the potatoes turned out very well: a little crispy on the outside, soft and fluffy on the inside with a pungent bite from the garlic mellowed out by the sweetness of the honey. 2. Place the wedges skin-side down on a foil-lined baking sheet. Toss with olive oil and season with salt and pepper. Bake for 25 minutes. 3. Meanwhile, combine the ketchup, soy, honey, lime juice & zest and garlic in a small sauce pan. Bring to a boil then reduce to a simmer, stirring frequently. Allow to reduce and thicken for 10 minutes. 4. When the 25 minutes elapse, remove the potatoes from the oven and turn on the broiler. Ensure the oven rack is in the middle. 5. Brush the sauce on to the sweet potato wedges and put them back in the oven for 10 minutes, brushing on the sauce at least one more time.